Damian Peach took this photo of Jupiter a few weeks after opposition from Selsey, in the United Kingdom. I spent a pleasurable day yesterday trawling Damian Peach's Jupiter photo archives. 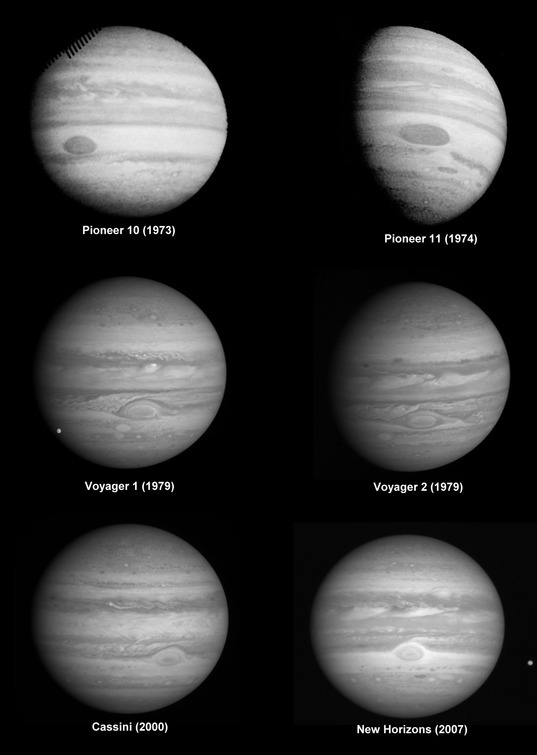 Here's a look at Jupiter from each of its last four oppositions. 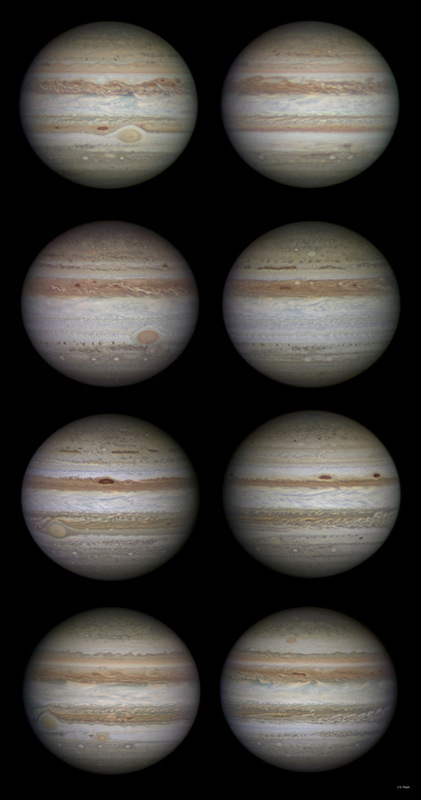 I picked two photos from each of the 2009, 2010, 2011, and 2012 oppositions, showing approximately opposite faces of Jupiter. Astonishingly, many of these photos were taken from his home in Selsey, West Sussex, in the United Kingdom, a country not known for having regularly cloudless skies (though Peach says that this town, which is on a promontory on the southern coast of England, enjoys clearer skies than typical UK locations). Peach also regularly visits an observing site in Barbados, which must be nice! All of these photos were taken by amateur astronomer Damian Peach. Each row represents one year; the two photos show approximately opposing hemispheres of Jupiter. Top row: September 10 and 7, 2009, from Barbados; second row: September 12 and 15, 2010, from Barbados; third row: October 1 and December 27, 2011, from Selsey; bottom row: December 27 and November 21, 2012, from Selsey. The changes from year to year are just fascinating. I've written before about the disappearance and reappearance of Jupiter's South Equatorial Belt, which is probably the most obvious of the time-varying features visible here. But there is so much more to see. Look at the region to the left of the Great Red Spot. Is it turbulent like when Cassini passed by, or smooth like when New Horizons passed by? Look at the color and banding within the Red Spot. Look, too, at the color of the Little Red Spot (also known as Oval BA). In 2009 and 2012 you can see that there's actually another Red Spot in Jupiter's northern hemisphere, a bit smaller than Oval BA. Check a red belt in any location in one year and see how different it appears in other years. The variety in the appearance of the northern hemisphere from year to year is fascinating. A total of seven spacecraft have visited Jupiter to date, and six of them returned global images. 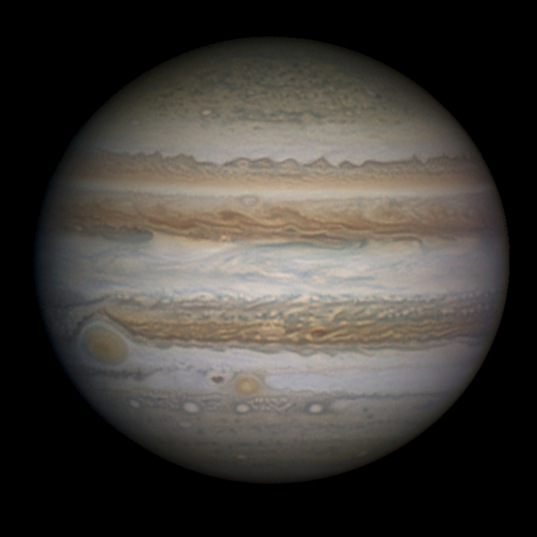 I am glad there are amateur astronomers keeping an eye on Jupiter! The detail on these pictures is amazing, as is the subject -- there's no object in the solar system with a more visually interesting atmosphere than Jupiter. I could watch films of its changing patterns all day long.